DIE HÄUSER HÄNGEN UNTER DEN WIESEN. THE HOUSES ARE HANGING UNDERNEATH THE MEADOWS. Silk screen in 19 colours. With metal embossings in 3 colours on heavy paper. Silk screen 9 in the portfolio LOOK AT IT ON A RAINY DAY (Regentag Mappe). Signed in print , LIMITED EDITION OF 3000 (840/3000). Printed by: Dietz Offizin, Lengmoos, Bavaria, 1971, in cooperation with Günter Dietz. Size: 19.5" x 26.4" (49.5 x 67.0 cm). Edition of 3000 mechanically numbered 1-3000/3000, 300 of which, ending in 9, are signed and numbered by hand Published by: Ars Viva, Zurich, 1972. Please consider the Photo's of the actual Artwork as part of the description. Please note that there sometimes can be a slight color variation from Photo to actual art work. Born Friedrich Stowasser on December 15, 1928 in Vienna, Austria, Friedensreich Hundertwasser was one of the best known Austrian painters and architects of the 20th century. Hundertwasser studied briefly at the Montessori school in Vienna and in 1948 he studied 19th century watercolour landscapes at the Fine Art Academy. He was influenced by the art of the Vienna Seccesion. The Austrian figurative painter Egon Schiele, and Gustav Klimt. In 1949 Hundertwasser traveled to Italy and met the French artist René Brô, with whom he later painted murals in Paris. During this time his work became more abstract but still contained symbolic figurative elements. Hundertwasser had his first solo exhibition in 1952 at the Art Club in Vienna. 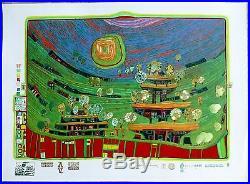 In 1953 Hundertwassers spiral motif began to appear in his work and was a reference to the creation of life. This motif became a constant element in his paintings, which included a combination of contrasting colors and vibrant pigments. Hundertwasser developed his transautomatism theory in 1953 which focused on the innate creativity of the viewer. 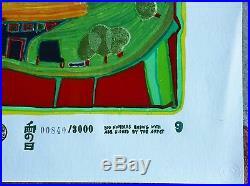 It wasnt until the 1950s that Hundertwasser began focusing on architecture. This began with manifestos, essays and demonstrations. In his view, the welfare of human beings depended on the style of architecture in which their houses were built. He believed that architecture would be the peoples third skin and that everybody must be enabled to design this skin as he likes, just as he may design his first (his natural skin) and his second skin (his clothes). In 1958, Hundertwasser released his treatise against rationalism in architecture titled Verschimmelungmanifest. In the 1960s he traveled to Europe and Asia and began producing architectural models for ecological structures. He also started refurbishing and decorating public and private buildings. He successfully took part in the Tokyo International Art Exhibition in 1960, and the following year he showed at the Venice Biennale. Hundertwasser became interested in graphics during the 1970s and designed the poster for the 1971 Monaco Olympics. 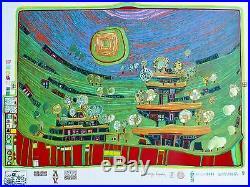 Hundertwasser also created flags, stamps, coins, and posters. In 1973 he published a portfolio of woodcuts by various Japanese artists who had used his paintings as inspiration. In 1972 he published a manifesto on the right to a window space and in 1978 the Manifesto of Peace. Both reflected the artists ideology about searching for harmony between man and nature. 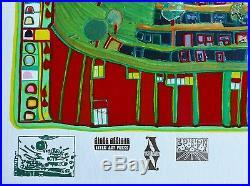 In 1998 the Institue Mathildenhöhe of Darmstadt held a retrospective of Hundertwassers work. The following year he moved to New Zealand and continued to work on architectural projects. 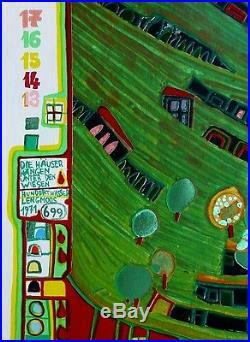 In 1999 Hundertwasser started his last project named Die Grüne Zitadelle von Magdeburg. He never finished this project although the building was constructed a few years later in Magdeburg, Germany, and opened on October 3, 2005. Just write so that we can work something out. If you invoice shows something else, please wait for revised invoice before paying! 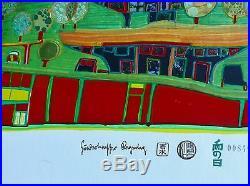 The item "Friedensreich Hundertwasser DIE HAUSER HANGEN UNTER signed mixed media Regentag" is in sale since Saturday, June 24, 2017. This item is in the category "Art\Art Prints". The seller is "dreamgalerie" and is located in San Diego, California. This item can be shipped worldwide.